There is no point designing and then constructing the backyard of your dreams if it is only destined to become dilapidated and neglected. 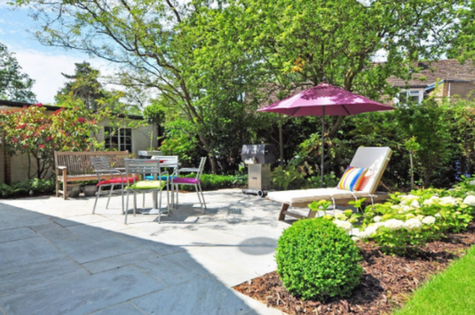 In a perfect world, all backyards would come equipped with dedicated staff who would proceed to maintain your outdoor living space for free. Unfortunately for most of us, this is not a reality and the cleanliness of the backyard falls entirely on our shoulders. So here is a brief list of some equipment that you must have on hand if your goal is to keep a clean and tidy backyard. By no means is this list all-encompassing, but it’s a fantastic place to start if the thought of cleaning your backyard leaves you feeling overwhelmed. The idea of using commercial and floor cleaning machines in the backyard often has regular homeowners raising their eyebrows. This is largely because people instantly, and incorrectly, envision an industrial-sized, ride-in street sweeper sitting smack bang in the middle of their barbecue area. This is totally unrealistic, not to mention complete overkill. There are many scaled down automatic sweeper options that are more suited to backyard settings instead. Walk-behind sweepers, or even small ride-on sweepers for those situated on larger properties, are an excellent alternative to conventional raking. Its wonderful having natural shade in your backyard. You and your family can relax under trees on hot days and spend less time worrying about sunburn (the keyword is less time - always slip, slop slap!) But the down side is that leaves from these trees will ultimately collect on the patio, BBQ area and around the pool. One common problem that instantly brings down the aesthetic of a backyard is an abundance of dead leaves. It gives your yard an unloved and abandoned feel. This is where the walk behind sweeper comes in. It allows you to pick up leaves, dirt, dust and debris, all without the back- breaking work of traditional sweeping or raking. After all, cleaning your backyard shouldn’t leave you feeling so exhausted that you can’t enjoy your outdoor space! Getting rid of stained and grubby features is another task that can instantly improve the feel of your entire backyard. If your backyard features tiling or smooth flooring, you should seriously consider using an automatic scrubber to maintain these areas. Once again, this does not mean you should rush out and hire a warehouse-sized floor buffer – options do exist for the residential home. Walk behind scrubbers, or even small ride on scrubbers for more expansive yards that feature tiles and flooring, are perfect for lifting the tough stains and dirt caused by the elements. In the past, getting outdoor features to sparkle like new was challenging. Scrubbing your feature tiles and flooring on your hands and knees is not a viable option – it is time consuming, not to mention extremely tough on your joints. Mopping is better than scrubbing by hand but, more often than not, conventional mopping is not enough to lift stains and discolouration. Walk-behind scrubbers are built to last, and their primary goal is to keep your outdoor surfaces looking brand new. Most modern models allow to you to select the ‘scrubbing path’ – so that your area gets cleaned, no matter its shape. If you have a large area to scrub an automatic scrubber will help save water, which is better for the environment and your utility bill. You fill up the tank once and you’re good to go, no having to stop and start to refill your mop bucket. Despite what horror films would have you believe, the primary purpose of a chainsaw is keeping your backyard tidy! You don’t need to be a professional lumberjack to own one, there are many smaller home-owners models that you can choose from today. Chainsaws come in so handy for keeping the boundaries of your backyard tidy, and for taking prompt care of any inconvenient overhanging branches. Chainsaws are also ideal for landscaping, if you have that creativity and skill within you! Electric models are best for the average homeowner, although you will find that dealing with any lumber may take longer. If you feel apprehensive about using a power tool for the first time, you can always opt for a battery powered, cordless chainsaw instead. These are great for keeping hedges and bushes under control. If your outdoor living space is less of a suburban backyard and more of a rural property, you’ll need something more durable. A gas-powered chainsaw is recommended for heavy duty tasks, because of the sheer power these models exude. Nothing gives off the vibe of dereliction more than a swamp-green pool that is full of rotting leaves. If you’re sweeping leaves up and cutting down unruly branches, you are already reducing the chances of your pool filter becoming clogged. But you should never be without a last line of defence, and in this case, that defence is a high-quality pool cleaner. If you pause to think about it, your pool cleaner will spend the duration of its existence soaked in chlorine and baking under the sun. Not to mention the distances it will clock up as it does the rounds of your swimming pool – some cleaners can rack up 1000km within the space of a year! So, it makes sense to steer away from budget models, and invest in a tougher brand. There are three main types of pool cleaner on the market: suction, robotic and pressure. Suction pool cleaners are the most common. As their name suggests, they use suction to take leaves and grime out of your pool and into the skimmer box for you to empty. Robotic cleaners run on electricity, you attach them to a nearby power point and the deploy them. These are recommended for larger pools. Pressure cleaners are more powerful than suction cleaners and tend to work a lot faster. What model you decide to go for will be dependent on your kind of pool and the surrounding environment. From the outset, maintaining a clean and tidy backyard can feel completely out of reach – especially when work and young families are involved. However, with the right equipment at hand, you can clean your backyard efficiently and spend the rest of your free time enjoying your space. New Advance technology leather sofa Cleaning was in a bad condition. It needed cleaning and repairing too. When I called new Upholstery Cleaning Melbourne, I explained them everything and I was amazed to know that they visited the same day of booking for my leather sofa. And now, it appears as it newly came .They deals in all upholstery like Dining tables Melbourne, Chairs Melbourne , Drapes Melbourne. Best SK Cleaners Melbourne are the experienced professionals of upholstery cleaning. I have used their commercial upholstery cleaning service for my restaurant and I can see the results in the sparkling eyes of my customers. I feel proud and the acclaim goes to SK cleaners. They usually come on the same day. I am one of their loyal customers. Benefits of Upholstery Cleaning Services. communal cleaning london job no-one likes doing; however, something our expert and experienced cleaners cope with all of the time. Kids Challenge: How does your backyard grow?